Pedro Rubio performs works written by Antonio Romero, Enrique Calvisst, Camilo Pérez Laporta, Manuel Monlleó Rosell, Cristóbal Oudrid, and Bartolomé Pérez Casas with the following wind bands: Banda Corporació Musical Primitiva D’alcoi, Banda de la Societat Musical “Lau Pau” de Beneixama, and the Banda de la Asociación de Amigos de la Música de Yecla. 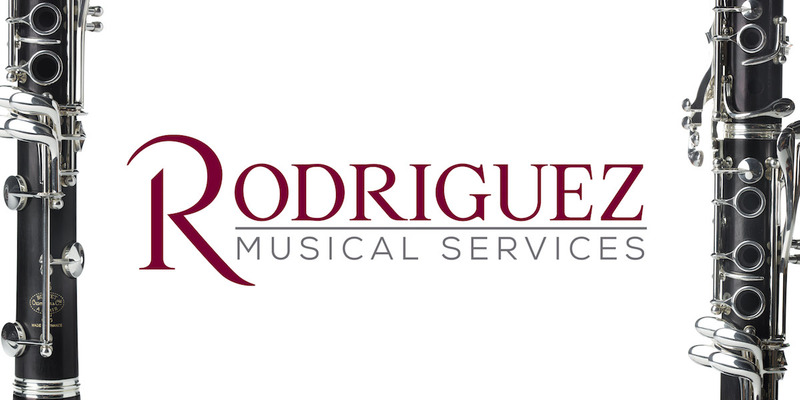 Rubio received a performance diploma in clarinet from the Royal College of Music in London and bass clarinet performance from the Rotterdam Conservatory under the guidance of Henri Bok. An advocate for Spanish repertoire, Rubio founded the publishing house, Bassus Ediciones, in 2007. Currently, Rubio is professor of clarinet at the Turina Conservatory in Madrid, and professor of bass clarinet at the Royal Conservatory of Madrid. 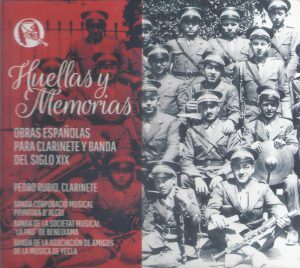 Huellas y Memorias translates to “Footprints and Memories.” The works heard on this recording were found in libraries, antique shops, auctions, and archives from cathedrals and churches in Spain. This recording contains a variety of works written in different musical forms for clarinet and wind band from the 19th century, discovered by Rubio in the last two decades. Rubio’s performances of these works are worthwhile listening; especially the technically demanding passages found in Rossell’s Fantasia para clarinete (1868). Other interesting works found in this recording are Romero’s Gran Concerto de Clarinete (1856) and Oudrid’s El Molinero de Subiza (1870), as they are so idiomatically written for clarinet and wind band. The musical and virtuosic qualities of these compositions are an important asset to understanding the development of Spanish clarinet repertoire. This recording is also valuable because it allows modern audiences to historically reconstruct the level of virtuosity of performers from that period of time. For those who are interested in Spanish clarinet repertoire with wind band from the nineteenth-century, I highly recommend this recording! 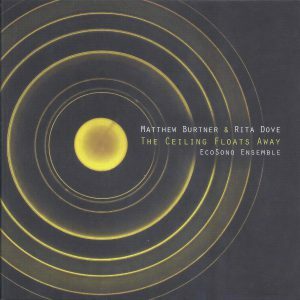 The Ceiling Floats Away features the work by Alaskan-born composer, sound artist and founding member of the environmental arts non-profit organization, EcoSono, which also happens to be the ensemble featured on the album. The entire album showcases Burtner’s imagination and creativity in regard to both the compositions themselves and his use of electroacoustics. Burtner has won several awards, including a Special Jury Award for this piece in the 2016 American Prize in Chamber Music Composition. This unique album is a concert work for chamber ensemble (flute, clarinet, cello, and piano), spoken and sung voice, and electronics. Another aspect of the album is the use of “Nomads” or software on mobile phones that allows for audience to interact and react to the composition. The album consists of 13 composed movements and these audience interactions, which are called Bridges. According to the liner notes, “during the Bridges, the audience uses Nomads to offer reflections, echoes and thoughts on the music and poetry. These thoughts create a new poetic musical piece generated by the audience and experienced in real time.” This work features the poetry of Rita Dove, who is a Commonwealth Professor of English at the University of Virginia. The chamber music compliments the poetry quite well creating an acoustic backdrop to Dove’s beautiful poetry. While the music is quite interesting on its own, I wish that the album or webpage at www.ravellorecords.com included the visual aspect of the audience reaction and use of the Nomads. 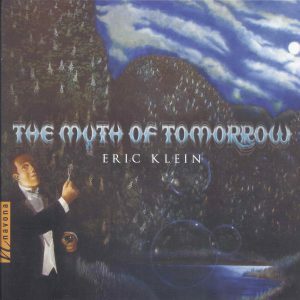 Featuring compositions by Eric Klein, The Myth of Tomorrow gives the listener an exciting variety of works for chamber ensembles. A composer of concert music, film and new media, Klein has a wonderful way of juxtaposing various instruments, whether combining different timbres in a single melodic line or pitting different instruments against each other as if they were having a conversation. The recording opens with a minimalist piece, Nettles, for clarinet, violin, cello and piano. Each short melodic line seems to begin with one instrument and is finished by another, similar to a couple that ends each other’s sentences. There is also a striking contrast of moods within the piece, seamlessly changing from cheerful to mysterious and back again. The second piece and title track of the album is a combination of harp, piano, percussion, synthesizer and Moog Taurus pedals. The third piece, Hoboken Suite, gives homage to the city within the “Garden State,” (New Jersey) of which the composer is based out of. It also features the free-bass accordion. This three-movement work begins and ends with exciting, driving rhythms of the accordion and features interesting pairings and melodic lines for the other instruments. Tracks six and eight (Dream Fragments and Parallels) both utilize the same atonal tone-row containing major tonalities. The use of these tones rows creates some unexpected twists and turns within the melodic lines and the electronics used in Dream Fragments adds to the mysteriousness. A piece written in memory of the composer late grandfather, 1899 is a beautiful work for flute, clarinet, bassoon, trumpet, vibraphone, piano and string quartet. The composer uses this unique instrumentation to create several tone colors to paint a beautiful picture. The last piece on the album, Hidden Places, is written for 16 solo instruments and again showcases various timbres. It provides a great ending to this wonderful album. Germany & French Clarinet & Piano Classics is a collection of classic works for clarinet and piano which includes both Brahms Sonatas, Poulenc’s Sonata, as well as Nicholas Baldeyrou’s transcription of the virtuosic Carmen Fantasy. The delicate interplay between the clarinet and piano in Brahms’ Sonata for Clarinet and Piano in F minor is expertly handled by both Viliunas and Shinn in a classic interpretation of this standard of the repertoire. The playing between the two is well balanced and the phrasing, which often overlaps, is always crystal clear and independent between the lines. There are moments in the first and fourth movements where there is interesting rubato, but it’s never out of the realm of fine musical taste. In his rendition of Poulenc’s Sonata, Viliunas has skillfully blended a standard interpretation while still injecting plenty of jazz personality, particularly in the first and third movements. The third movement in particular is filled with lots of personality and dramatic contrast in articulation and dynamics. Viliunas has a vibrant, clear tone quality that is well-suited to such dramatic music and he easily brings this piece to life. In this interpretation of Brahms’ Sonata for Clarinet and Piano in E-flat, the playing again is well-executed and clearly displays a complete understanding of the piece. The intonation is nearly flawless throughout and the phrasing, is reflective of a standard interpretation. Technique is clean and demonstrates a complete commitment to the details in the score. It could easily serve as a reference recording for anyone studying the piece that is looking for a mainstream version with fine musicianship from both the piano and clarinet. Bizet’s Carmen Fantasy, arranged by Pablo de Sarasate and N. Baldeyrou, presents Viliunas at his best. He clearly has complete command of the instrument in difficult technical passages, and extremes in dynamics and the upper altissimo range. He easily navigates technique that not that long ago would have been considered impossible on the clarinet, all the while maintaining his signature sound and excellent intonation. This piece is filled with Viliunas’ personality and he shines particularly brightly in this work. 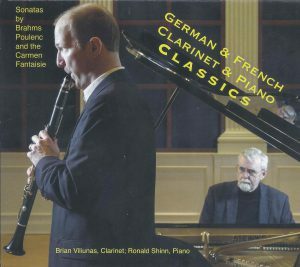 The disc as a whole is well-mastered and exhibits fine playing from both clarinetist Brian Viliunas and pianist Ronald Shinn. Viliunas particularly excels in his mastery of the technical demands of the Bizet Carmen Fantasy – this is an excellent disc and you won’t be disappointed. 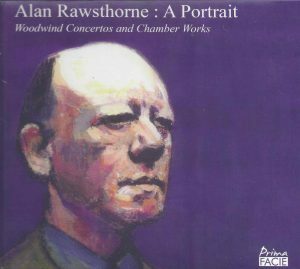 The Concerto for clarinet and string orchestra by Alan Rawsthorne is featured on this album of his music titled Alan Rawsthorne: A Portrait. The piece is four movements and lasts a little over 16 minutes. Linda Merrick and the Manchester Sinfonia, conducted by Richard Howarth, perform the work beautifully. The first movement, “Preludio,” is at a moderate tempo and features a meandering clarinet line mixed with an intense, brooding orchestra. This movement showcases Merrick’s beautiful altissimo tone and flawless pitch. The second movement is titled “Capriccio.” It begins with a sneaky and disjointed sounding clarinet line that highlights the clarinetist’s fluid technique. The middle section of this movement has little from the soloist but showcases shimmering strings before returning to the opening material. The third movement, “Aria,” begins with a low, mournful clarinet. Merrick displays a lovely, dark chalumeau register and a striking dynamic range, which blends well with the heart-wrenching motives in the orchestra. Finally “Invention,” lives up to its title with a fun, winding clarinet that is closely followed by the strings. While the articulation in the clarinet could be clearer, the lighthearted style and the bouncy spirit with which Merrick plays make this movement especially enjoyable. Interestingly, the album features two different endings to the piece. Track five is labeled as the original ending in which the clarinet runs up a scale to a trill in the clarion register and finishes somewhat anticlimactically. Track six is the revised ending where the scale stops briefly in the clarion before moving all the way into the altissimo. It finishes a little more grandly with answering low notes from the orchestra. Regardless of the two contrasting conclusions, Rawsthorne’s Concerto is a gratifying and interesting work worthy of consideration for future programming. Heather Roche is a Canadian-born and English-trained clarinetist based in London. 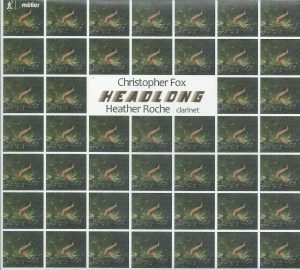 Headlong is the culmination of her extended collaboration with English composer Christopher Fox (b. 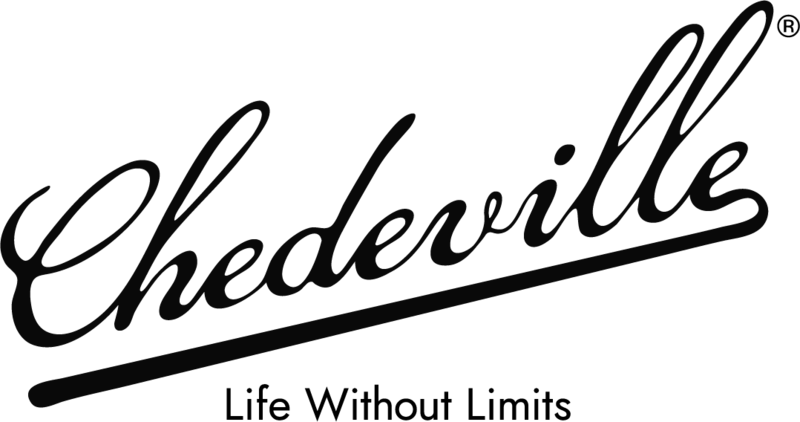 1955), dating back to 2007. This album comprises pieces originally written for clarinet(s), as well as transcriptions for other mediums, which were composed between 1980 and 2015. Roche performs all clarinet parts on this album. As a listener unfamiliar with this composer, I welcome Roche’s commitment to exposing Fox’s substantive body of work to a large audience. Roche expertly navigates the wide and persistent large intervals in stone.wind.rain.sun with incredible ease and shows off her flexibility on the bass clarinet in Straight lines in broken times. …or just after and Escalation are two well-written pieces (the former on clarinet, the latter on contrabass clarinet) that explore primarily the softer end of the dynamic spectrum, a bit of a rarity in solo clarinet literature. Originally for bass clarinet and tenor saxophone, Early One Morning is an excellent addition to the repertoire for clarinet and bass clarinet. While there are occasional intonation discrepancies, Roche does an excellent job of blending the timbres of the two instruments. With its three playback channels, Unlocking the Grid creates a haunting world of harmony, while Fox’s use of square-waves in Headlong provides a refreshing change of timbre. Divisions, my favorite composition on the album, features a wide variety of gestures and styles that Roche exemplifies with both elegance and intensity. Although featuring only one composer, this recording has something for everyone: all sizes of clarinets, in both acoustic and electroacoustic settings. Beyond this, I also relished Fox’s liner notes, which read more like a well-conceived monologue than a mere description of the music. I recommend this recording to all clarinetists looking for new repertoire from the 20th and 21st centuries. 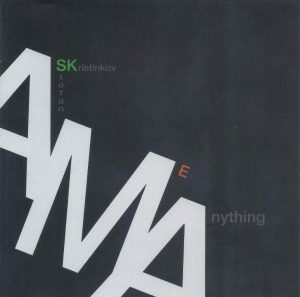 Ask Me Anything is comprised entirely of electroacoustic works composed and performed by Stefan Krisitinkov. The musical styles on this album are quite eclectic, at times echoing Varèse or the American minimalists, and at others feeling like the thumping groove of a NYC nightclub. At the center of every work is Kristinov’s deft clarinet playing accompanied by acoustic strings and electronic effects. Kristinov’s command of the instrument is especially notable in the long, seamless melodies he weaves in and out of the various musical textures in tracks such as Better to Have and Cute Train. Also worth noting is the sentimental ensemble playing in Incipit. Kristinkov’s work perfectly exemplifies the manner by which traditional clarinet playing can be combined with mainstream music, a truly laudable outside-the-box approach. Ask Me Anything is certainly a must-have for any in our field with an interest in electroacoustic music, and offers a welcomed addition to those searching for ways to stretch the traditional venues of clarinet playing. More information about Stefan Kristinkov can be found on his website, http://www.stefank.us. Overall A.M.A. is equally poignant, jaunty and fun! Paper Gates, Andy Rayborn’s alter ego, performs, writes and records electronically altered bass clarinet music. Memory Box is his second album and is available digitally or on cassette tape, if you meet him in person. The recording is accompanied by 36 pages of liner notes which include the story of the origin of this work, as well as some sketches of the music. The entire project feels deeply personal. According to the artist, the music was written to depict a pivotal time in his life which he elaborates on in the liner notes. There are six works on the album. The first track, Need, begins with a low grinding bass clarinet melody before a fun popish beat enters with the bass clarinet playing high, yearning melodies. The second track is titled Reichu a Letter and begins in a very straightforwardly jazzy way that reminds one of rock music from the 1960’s, background claps included. It focuses largely on repeating simple melodies and harmonizing them before ending on an unexpectedly ethereal chord. On and On begins with piano and synthesizer, the bass clarinet rhapsodizing in a way that is reminiscent of a love ballade from the 1980s. Next, Youth Culture of Decades Past, weaves together varied bass clarinet melodies and accompaniments in styles that change over the six-minute piece. This track also feels most musically ambitious because of its overall scale and the way the individual lines develop and intermingle. Track five, Chrysalis, can best be described as groovy with a driving low line and funk-suggestive top line before it transitions to an otherworldly, synthesizer heavy, middle section. Finally, Lived and Died, differs from the other tracks because of its reliance on the electronics for most of the upper parts. The bass clarinet provides drones and ostinato lines. 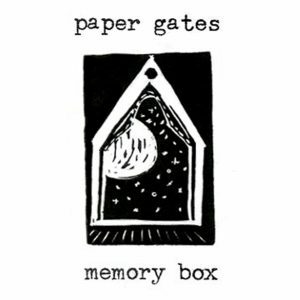 As a whole, with Memory Box, Paper Gates has succeeded in making an album that is eclectic, interesting and fun to listen to. 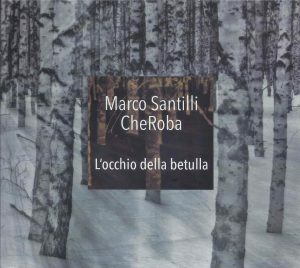 Clarinetist/composer Marco Santilli is joined by fellow members of CheRoba on L’occhio della betulla, a disc of original works composed for this unique jazz quartet. CheRoba consists of Santilli on clarinet and bass clarinet, Lorenzo Frizzera on twelve-string and classical guitar, Ivan Tibolla on piano and accordion, and Fulvio Maras on percussion. The ensemble performs with great synergy and all members’ exhibit skillful musicianship, which lends perfectly to Santilli’s compositions. Santilli’s smooth tone and virtuosic technique on both clarinet and bass clarinet are a perfect complement to his skillful improvisation displayed on this disc. Occasional, tasteful use of extended techniques contribute to a heightened sense of energy and impact when appropriate. In addition to his ability as a clarinetist and bass clarinetist, Marco Santilli is also a very skilled composer. Each carefully crafted work takes the listener on an aural journey through a sonic landscape interspersed with elements of classical, world music and jazz. Each track on the disc varies in style, but still works well as an overall concept for the album. Santilli’s compositions are refreshingly original and truly highlight the talents of this ensemble and the capabilities of his instrument in this setting. This recording is enjoyable and sure to be favored among clarinetists and non-clarinetists alike. Highly recommended. 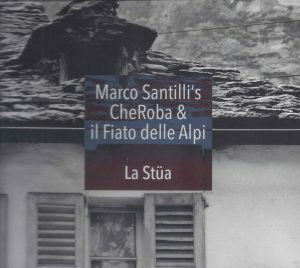 Clarinetist/composer Marco Santilli’s jazz quartet CheRoba joins forces with il Fiato delle Alpi (breath of the Alps) wind quintet in La Stüa. All of the works contained on the disc were composed by Santilli and recorded live at Musikinsel Rheinau (Switzerland). The included booklet contains information about the project and inspiration for each work, giving the listener a perspective on the programmatic nature of many of the compositions; the combined timbres of CheRoba and il Fiato delle Alpi are the perfect vehicle for expression. La Stüa features a unique blend of instruments between the two ensembles. CheRoba’s clarinet/bass clarinet, guitar, piano (accordion), and percussion coalesce with il Fiato delle Alpi’s alto flute (flute, piccolo), English horn (oboe), contrabass clarinet (clarinet), bassoon, and horn to create a stunning instrumental timbre. Chamber music punctuated with exciting improvisation from Santilli and other members of the ensemble make for an engaging performance. While Santilli is featured frequently as a soloist, the other musicians rarely play a subordinate role; rather, the ensemble is featured in its own regard. Marco Santilli is a skilled composer as evidenced by La Stüa. Each work is distinct and contains elements of contemporary music, various European traditions, world music, and jazz fused together to present a modern tone poem of sorts. Like a good story, each work evolves organically, taking the listener on a journey through the various places and tales that inspired the composer. La Stüa would be a valuable addition to the collection of clarinetists and non-clarinetists alike. The album is enjoyable with its creative instrumental timbres and eclectic musical styles.